For many moons you have prayed up to the Shake Shack gods, and this week, loyal burger believers, your prayers are answered: for there shall be free Shake Shack on Tuesday, August 16. Every single Shake Shack location (aside from ones in stadiums) is participating in this mouthwatering madness, in celebration of the chain opening its 100th store at Boston's Seaport. There is just one slight caveat ... only the first 100 burgers are free. So basically tomorrow morning every Shake Shack is temporarily becoming a Hunger Games arena. 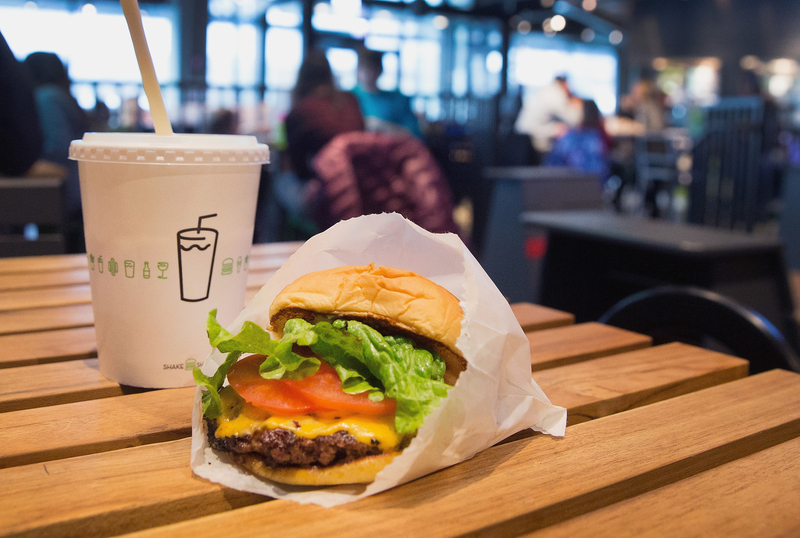 But for those of you who are willing to brave the lines, the Shake Shack locations will be opening their doors at 10:30 a.m., and early birds will be rewarded with one Shackburger or a burger of equal or lesser value. Truly, though, can you put a price on that kind of glory? I'm personally too weak to consider lining up at the OG location in Madison Square Park that opened in 2004, but for those of you who are going to be there tomorrow, I salute you, and so does your country. For I imagine there is no greater honor than shaking some shack in the wee morning hours on a Tuesday. Fun fact, guys: Shake Shack actually started out as a hot dog cart in Madison Square Park in New York. Since then you've probably come to know them more for their epic Shackburgers, crinkle-cut fries, and insane rotating flavors of frozen custards, but hot dogs are still #representing on the menu. So the good news is even if you don't end up being one of the first 100 in line, you can ease the pain of it by ordering everything all at once and going to town. Incidentally, I have made myself so hungry in the course of writing this post that I am one more Shake Shack GIF away from pitching a tent in Madison Square Park and hoping I can steal nearby WiFi to get me through Tuesday morning. The game is on, fellow New Yorkers. May the Shake Shack odds be ever in your favor.